2018 came a went in what seems like an instant. Much like 2019 is going. The old adage that the older you get, the faster time goes is seemingly true. 2018 was an amazingly successful running year, not just for the physical impact and achievements, but for the personal ones, as well. And we all know that while a tribe may not make or break a journey, it sure does make the journey way more fun (shout out to my #runmigas)! Biggest feat? In April, I became an ULTRAMARATHONER! 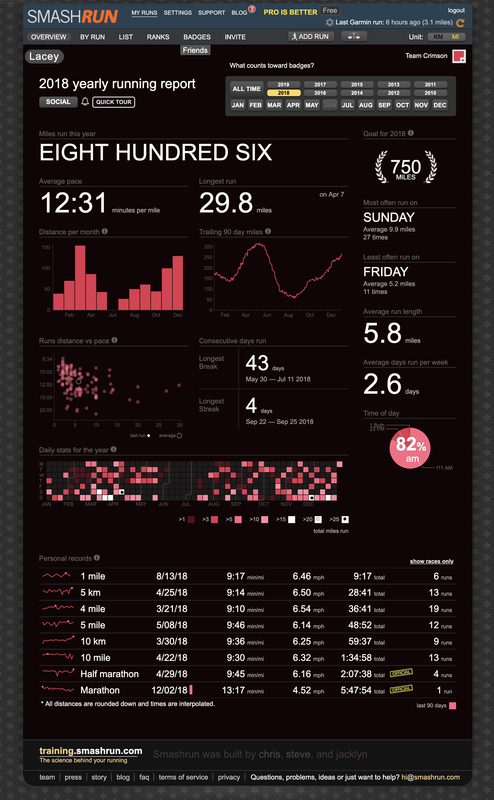 In 2018, I ran 805.8 miles (completely injury free, thank God). I fell short of my 1000 mile goal, but after taking 6 weeks off for surgery recovery, I am not at all disappointed in that. I completed 13 races; 2 5K’s, 2 5 milers, 3 half marathons, 2 15K’s, 1 full marathon (yes, that one I said I’d never run), 1 50K, and 2 relays. I ran in 6 different states, adding 4 new ones to my list! I aquired 7 new pairs of Goodr’s for my collection (I am slightly addicted). I added 4 new pairs of Altra’s to the rotation and retired 2 pairs. Every cent was worth it. The laughs, smiles, challenges, personal growth, relationships, and experiences. Those are worth far more. I’m looking forward to 2019. I have some BIG challenges facing me this year (more about that later), but my goals are BIGGER.